Reviewing Authority's Recommendations: Accused mistreated, abused and tortured POWs for no reason or at the slightest provocation (allegedly influencing other PWs to slow down their work) or for infractions of the camp rules (stealing food, talking to a Korean workman). Reviewing Authority: Superior Orders: only the camp commander had the authority to place prisoners in the guardhouse, to take away food and drink. Starvation and beatings by the camp commander was responsible for the death of POWs. In other trials, the name of the accused is not mentioned in conjunction with this incident. The accused stated that he had struck POWs on about 10 occasions, but these beatings were done under the orders of the camp commander. He stated that he himself was beaaten when he failed to beat prisoners. Denied knowing of many specifications and stated that he was not in the camp during certain periods alleged in the specifications. Prosecution Arguments: The defense made a motion to strike the words "contributing to his death" from specification 10 and 19 of the Charge which the Commission overruled. The reviewer stated that this motion was properly overruled because previous trials had ruled that "if the specifications inform the acccused of the crime charged; the wording is not material." Furthermore, in regards to whether the wording implies contribution or causation, it does not matter in terms of the legal result. "War crimes concepts are not concerned with such over-legalistic niceties as the defense urges on this point, but only with the fundamental and fair protection that civilized nations demand for those accused of crimes" (Docket No. 46). Reviewer states that all specifications should be approved with exceptions in certain cases: 1, 3, 4, and 7 because the prosecution failed to prove that the accused was responsible for the treatment described by the words, "torture," "forcing him to kneel for a long period of time exposed to cold weather" or "with a board behind his knees" and "thereby contributing to his death." And in regards to spec 7, "torture" should be stricken because no evidence of torture in this specification has been shown. In regards to the sentence given by the commission, "it is not felt that the prosecution has proven the accused guilty of causing the death of a prisoner of war," and because of that the sentence should be commutted to 40 years CHL. Judge Advocate's Recommendations: Lt. Col., Allan R. Browne, JAGD, stated that he disagreed with the reviewer on all points except the following: For spec 1, 4 and 10, "the mere fact that the accused did not order the man to kneel is not controlling. They participated in the several acts...Muta is charged directly with responsibility in one exhibit. 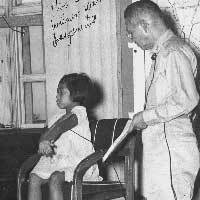 A consideration of the vicious abuses and their direct consequences revealed in paragraph 9 on page 9 of the foregoing review compels a conlusion that the loss of of circulation and gangrene were the direct result of and were proximately caused by the mistreatment in which Muta and TAkeda were participatns, both as actors and accessories, hence, principals. A finding of guilty of tortuure is justified." For spec 3 and 7, in considering responsibility for the death of Knight, it is not necessary to find a conspiracy in order to hold each of the accused. If they were accessories, hence principals, aiding each other in accomplishing the death, each may be held regardless of the presence or absence of a preconceived plan or conspiracy...if at the moment of death, it can be said that both injuries are contributing thereto, the responsibility rests on both actors." Allan R. Browne quotes a letter received from the brother of one accused; it is generally a comment on how the trials are a necessary component of the elimination of Japanese militarism and the establishment of democratic Japan. It would be interesting to do a project going through other writings from the period to see if this was the way that other viewed the trial as well.